India’s Jeev Milkha Singh came through a playoff against Francesco Molinari of Italy to win the Aberdeen Asset Management Scottish Open at Castle Stuart Golf Links near Inverness. On a blustery final day, the scoring at Castle Stuart was nowhere near as low as it had been for the first three days and Milkha Singh’s closing 67 was the joint lowest of the day. When he posted that number it looked as though he would come up just short with a four round total of 17-under-par. Scotland’s Marc Warren had raced to 20-under-par after three straight birdies from the 10th. 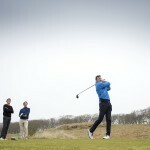 But nerves got to the Scot and his round fell apart between the 15th and 17th holes. From the 15th tee he hit his drive into the right rough and his second went right again. It was lucky to find a spectator walkway but, after pitching on, he three-putted for a double-bogey six. Warren followed that with two further bogeys to drop to 16-under-par. He was unable to find a birdie on the home hole and so came up just one shot shy of Milkha-Singh’s clubhouse lead. Alex Noren of Sweden should have joined Milkha Singh on 17-under, but he missed a short par putt on the final green and, he too, came up one short. Francesco Molinari also looked like he might win the tournament outright when he got to 18-under-par. But he dropped a shot at the 15th and was unable to correct the error. In the end he made a clutch par putt on the final green to match Milkha Singh on 271. Extra holes were required so the pair returned to the testing par-5 18th. Both played two solid shots to allow them to approach the green with their thirds. Molinari found the surface, some 25 feet from the cup then Milkha Singh put his about 10 feet closer. Molinari’s putt never looked like going in, so the door was open for the Indian. He duly rolled his birdie putt home and became Scottish Open champion for 2012. With the victory he has earned a start at next week’s Open Championship at Royal Lytham.